While visiting our pal Jeanette recently in LA, I had a curried chickpea dish at Vibe that left me craving all the flavors when I got back home. So I got to work and kept things simple. This dish requires just 30 minutes and 1 pot to create. It’s really stripped down to the essentials while keeping big flavor intact! Let’s cook, friends. It all starts with sautéed shallot, garlic, ginger, and serrano pepper. Then we throw in the ultimate flavor punch – red curry paste! Look at all that goodness. Swoon. Next, we add in some coconut milk for creaminess and natural sweetness. And for even more depth of flavor, we included coconut aminos (or tamari) and turmeric. The heartiness comes from plenty of chopped cauliflower and cooked chickpeas, which simmer away until tender. That’s it! It’s meal time. This is the perfect meal when you need something flavorful and comforting on the table fast. Divide between two people and you’ve got an entrée with 20 grams of protein (each) on your hands! It’s tasty straight up as soup, over grains as a curry bowl, or over greens for more of a salad vibe. You can’t go wrong! 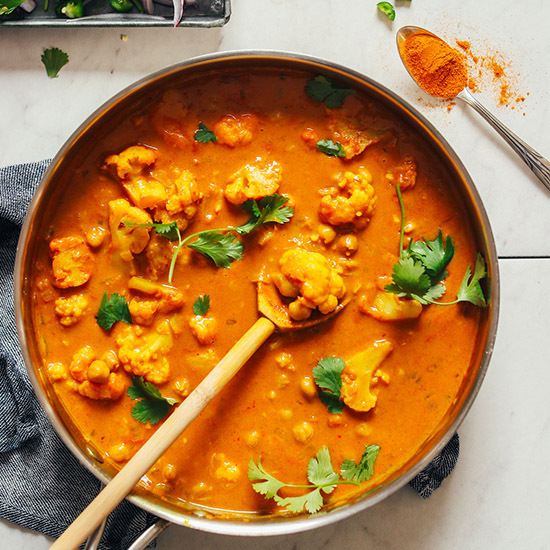 For more curry dishes, be sure to check out our 1-Pot Pumpkin Yellow Curry, Spicy Red Lentil Curry, Rich Red Curry with Roasted Vegetables, Curry Roasted Vegetables & Lentil Kale Salad, and Vibrant Coconut Green Curry! 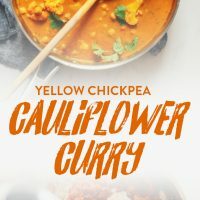 Easy, 1-pot Vibrant Yellow Curry with cauliflower and chickpeas! A 30-minute hearty and satisfying entrée or side perfect over greens, cauliflower rice, or grains! Heat a large pot, rimmed cast-iron, or metal skillet over medium heat. Once hot, add water or coconut oil, shallot, garlic, ginger, and serrano pepper. Sauté for 2-3 minutes, stirring frequently. Add curry paste (starting with the smallest suggested amount and adding more later if needed) and stir. Cook for 2 minutes more. Add coconut milk (see photo), turmeric, maple syrup or coconut sugar (optional), coconut aminos (or tamari), and stir. Bring to a simmer over medium heat. Once simmering, add cauliflower and chickpeas and slightly reduce heat. You want a simmer, not a boil, which should be around low to medium-low heat. 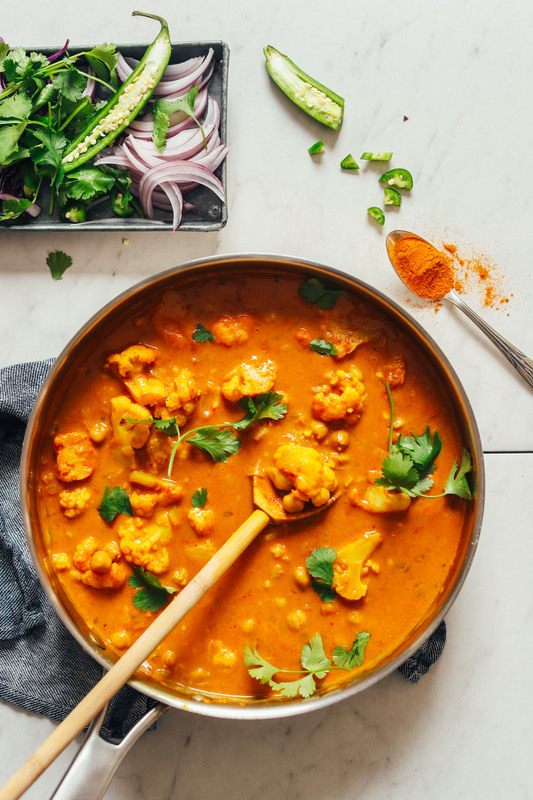 Cover and cook for 10-15 minutes, stirring occasionally, to soften the cauliflower and chickpeas and infuse them with curry flavor. Keep at a simmer - lower heat if boiling. At this time, taste and adjust the flavor of the broth as needed. We added more coconut sugar for sweetness, coconut aminos for saltiness, and turmeric for earthiness. You can also add more curry paste for more spice and intense curry flavor. Don't be shy with seasonings - this curry should be very flavorful. Serve as is, or over rice, quinoa, or greens (optional). Garnish with desired toppings such as sesame seeds, cilantro, lime, or diced red onion (optional). Store leftovers in the refrigerator up to 5 days or in the freezer up to 1 month. Reheat on a stovetop. Add additional coconut milk if it needs more moisture. *Based on my research, the only difference between red and yellow curry paste is lemon juice and turmeric powder. So if you have yellow curry paste, use that and omit the extra turmeric (to taste). But if using red (as I suggest), simply include the turmeric as instructed. *Ensure that your curry paste is vegan friendly (and does not contain fish ingredients). We love this brand. *In place of maple syrup, you can also substitute coconut sugar. *1 1/4 cup cooked chickpeas is equal to 1 15-ounce (425 g) can chickpeas. *Find my favorite method for cooking brown rice at Saveur! *Nutrition information is a rough estimate calculated without optional ingredients and with water (not oil). *Inspired by our Coconut Curried Golden Lentils and the "bombay" bowl at Vibe in Newport Beach. My husband was so impressed with this dish! It was a tad on the Spicer side when I used one Serrano pepper but still ended up tasting really great! It probably took me closer to 40 min to make though. I will definitely be making it again! This is so delicious! Easily my new favourite home curry recipe. I increased the amount of red curry and tamari by a tbsp each after tasting and added some chopped kale at the end because I happened to have some extra on hand. We served it over jasmine rice and it was indulgent. Next time I’ll add more vegetables. Red pepper, broccoli, snow peas, and water chestnuts would all be delicious additions to this. My whole family loved this recipe! Seriously Delicious, if you are a curry fan! This is amazing and is part of our regular meal rotation now! Thank you for this delicious recipe. I too used the green curry paste as this is what I had on hand. It is great. I made this last night for my family. Husband, son (vegan) and his young daughters, who have never liked “spicy” food. I have a pressure cooker (Instant Pot) so I cooked my own garbanzo beans. I didn’t have a Serrano chile, so I used a jalapeño. I used a full fat coconut milk. I probably made other slight changes, but in the end, we were licking our bowls! So good! The blondes could taste the spice, but loved the warmth. I suggest using a different curry paste brand. I’ve tried using Thai Kitchen in the past and was not a fan. A bit too bland. I suggest Maesri brand, they make all kinds of vegan pastes including Red, green, yellow, massaman, panang. Look for it at asian grocery stores. This was fantastic! When i started my elimination diet/ healthier lifestyle i was so concerned I wouldn’t be able to find dishes with such great flavor. I am so glad a friend turned me onto your site. The curry was so flavorful. I think next time i’ll also add some potatoes. Everyone in my house really enjoyed it as well! Absolutely delicious and super easy/quick to make!! We used 3 tbsp of red curry paste (Thai Kitchen brand) and it wasn’t too spicy at all. We used soy sauce instead of coconut aminos (3 tbsp instead of 2 since I prefer saltiness) and it turned out perfectly! Definitely comparable to Thai restaurants – thanks so much for this recipe! Y’all are wonderful. This was phenomenal! I omitted the pepper and the sugar and it was perfect. My husband doesn’t like spicy foods and he loved it. Thanks for a great plant based dinner that even my meat eater husband could get on board with! Yay! We’re glad that you both enjoyed it, Carleigh! Hi Dana, when using can coconut milk, should it be refrigerated first and solid only used for soups or just mix and contents as they are? Also how long can a can of this last once in fridge before expiring. Thank you, you are my go to wise vegan chef! Hi! For this, you can just use the entire can (unrefrigerated or refrigerated) And I am guessing you’re meaning an open can? Coconut milk that has been continuously refrigerated will keep for about 4 to 6 days. I’ve made this delicious soup two times before with 3 TBSP of red curry paste by “Thai Kitchen”and it rocks. It is so easy and full of flavor. I used tamari instead of coconut Aminos b/c I did not have. Today I will make with preferred coconut aminos because I bought it for Dana’s delicious Lentil Loaf I made on Thanksgiving. We are glad you have enjoyed this recipe many times, Lauren! Oh my goodness, this was delicious. I used 5 tbsp of curry paste with the pepper and thought the spice was just right. I served over quinoa and it was super awesome. This is a keeper….. This recipe is really simple and super flavorful. I appreciate that it uses pantry staples (curry paste, chickpeas, coconut milk, etc.) and just a few fresh ingredients (cilantro, ginger, garlic, shallots, cauliflower) that we use in a number of recipes. It only takes a few minutes and (more importantly for me) little to no culinary skills to make this dish. Thank you for sharing this delicious recipe with us. Loved this recipe. I used 3 Tablespoons of red curry paste and a seeded jalapeño instead of a serrano, since that’s what I had on hand, and found the spice level very moderate, but of course not all peppers are created equal on the heat index! I didn’t have a shallot, so used chopped leek. I also used one can of coconut milk, instead of the 2 cups. I garnished liberally with fresh lime juice, chopped cilantro and shredded red cabbage. In spite of all of the substitutions, I can say this is a winner, and obviously very adaptable. Can’t wait to make this again, especially since I ate nearly all of it by myself! I just made this dish and I loved it! I’ve never made curry before but I eat take out Thai pretty often. I made it with the addition of a medium potato and a red bell pepper (other people made tweaks and I liked their suggestions). I did leave out the Serrano pepper though because I can’t handle too much heat. I think I’ll make more next time and freeze it for work meals. Thanks a bunch for this recipe. I was absolutely thrilled with how this recipe turned out. Extremely rich, creamy and flavorful. It’s a fantastic recipe that I will definitely make again. Yay! We’re glad to hear that, Sarah! Hey!! Can you sub curry powder for the curry paste? Would that work for this recipe? Thank you ! Big Fan! Hi Sofia! Another reader used 3 tablespoons of curry powder instead of curry paste and had success. This is simmering on my stove as I await the water to boil for the brown rice noodles I’ll be serving with this flavorful one-pot curry. I followed the recipe exactly and I’m very pleased with the results. I also appreciate your detailed notes following the recipe. I’ll be enjoying a bit for dinner tonight and once again, creating lunch envy in the break room with my leftovers for the next couple days. Thank you for another winner! Wow!!! This curry is insanely delicious!!! I ended up adding an entire head of cauliflower and adding some additional water for more broth. So flavourful. So delicious. So easy!!! Made 4 perfect portions. I’m a little late making this recipe (and finding this blog), but I’m so glad I finally did. The food was amazing and the recipe was easy to follow—even for a novice like me. Additionally, the recipe met my dietary needs. I look forward to cooking and enjoying more of your recipes. Thank you! I made this last night and it was amazing! I used Maesri red curry paste, subbed cannellini beans for chickpeas, added sweet potatoes and extra cauliflower. Served over brown rice…. Absolutely Delicious! I am so excited for leftovers today! I Read all the other reviews and next time I think I will add spinach and throw in some avocado for the finale. Also, love the idea of serving over red lentils! Great idea, Sarah-Beth! We’re glad you enjoyed it! This was easy AND delicious. I’m not the “chef” in our family and I’m so proud (as is the actual chef) of how it came out! Can this be made in crockpot? Trying to find good recipe for crockpot? Hi Lisa! We haven’t tried making this recipe in a crockpot but if you experiment with it, report back on how it goes! Really yummy. Made it 3 times in a month! Leftovers great for a healthy lunch! This is so easy and fast. Serrano pepper can make it a bit hot, subbed milder pepper and that works just fine. Served over chopped cabbage salad topped with brown basmati rice. The crunchy cabbage added a nice element. I’m not a huge garbanzo fan…. this recipe is making me re-think the use of them more often! Very satisfying vegetarian meal. Must top with cilantro and a dollop of plain Greek yogurt! I’ll be making this again and again! I made this with potatoes, carrots, onions, peppers, kale, garbanzos, and spinach. I doubled it and used a whole can of paste. My husband thought it was too spicy, but more for me LOL. I enjoyed this a lot and I will be making it again. I hope it’s not too fattening with the coconut milk. I served over rice. Third time making. Thinking about adding in something else for flavor. It was a bit bland. Needing to cut back on maple syrup perhaps maybe more (or fresh: used refridgerated ginger paste you’d get in produce sections) ginger. Maybe more garlic? To be fair I don’t think I let the onion and garlic sauteed long enough. That that was the problem? But will continue to make: basically this is just the recipe for a basic curry sauce. I suppose after that any easily simmer to cook vegetable would work. Did this once with some carrot finely chopped that was good as well. The idea of this recipe sounded very tasty to me. I often make curry flavoured dishes, frequently from scratch and sometimes with various kinds of curry powder. I’ve never used paste before. I bought some Thai red curry paste for this recipe. I began with just 2 Tbsp. It didn’t have enough curry flavour and it tasted bitter to me. I added another Tbsp. More bitter still, but not enough curry flavour. So I put in some curry powder. The curry flavour was finally at the level that I wanted. I Left out the pepper. The heat was enough without it. I believe that the bitter taste comes from the paste. I tasted a little of the paste and found it to be bitter. Poured over rice it was okay. I added extra curry paste (red), omitted the sweetener, and it was beautifully delicious! My family had it over rice, and I ate it over greens to keep it a lower carb meal. SO SO GOOD! Long time lurker, first time commenter here. I feel I have to because this was absolutely delicious! The only change I would make would be to cook it for longer so the veggies soften. Otherwise, it’s perfect! Even my carnivorous partner devoured it. We are glad you enjoyed it, Loren! Made this tonight and loved it! I only had 2 tablespoons left of red curry paste and it still tasted great. I omitted the Serrano pepper (didn’t have one). Used olive oil to saute, 1 T of brown sugar instead of maple syrup, full fat coconut milk, soy sauce, couple Ts of lime juice and topped it with chicken for the hubby ( sorry vegetarians 😮) Spooned it over a bed of shredded kale. Will definitely be making this again and again! Thank you for the fun and easy recipe! Thanks for sharing your recipe changes, Barb! We are glad to hear you enjoyed it! so easy and delicious meal! thanks again!! My family really enjoyed this recipe! I used green curry paste, which gave it a milder level of spice without sacrificing the great curry flavor! Even my 18 month old daughter loved it! We served it over Jasmine rice with fresh avocado and cilantro. Will definitely be making it again! We are glad to hear that your whole family enjoyed it, Kirsten! This was absolutely delish! I used 4 tablespoons of red curry paste and it was perfect! I’m not a huge fan of garbanzo beans, but I have to say they were delicious in this recipe! This is a definite keeper! Thanks for your brilliant recipes! Yay! Thanks for sharing, Susan! This was perfect as is! We had it over brown rice one day and red lentils the next, both meals were delicious!!! Yay! Glad you enjoyed it, Sara! I made this (as directed – using jalapeño pepper instead of serrano ) and red curry paste. Delicious. My non-vegan friends loved it (she asked for the recipe and made it herself a few days later). My husband doesn’t like really spicy food and thought this was perfect for heat/flavor. Yay! Glad to hear it, Bec! Great for a quick weeknight meal. I used 3 Tbs red curry paste (Thai Kitchen), omitted the Serrano because I didn’t think my little one would eat it if I made it as spicy as the adults would like it. I used a can of lite coconut milk and a can of chickpeas (instead of measuring). We served it over a riced veggie medley of carrots, broccoli and cauliflower that I found in the frozen food section. Next time I’ll probably add potatoes and throw in some spinach or kale like one of the other commenters did. I will also make sure to have cilantro and red onion to top it. Today all I had on hand was avocado, which was great too. Very versatile recipe! This will go into our regular rotation. 5 stars!! Thank you for all the recipes. I love making elaborate dishes, but appreciate simple, easy-to-make, flavorful recipes during the week. Your recipes have been a life-saver in my pregnancy!! What I just find interesting is that most people never add Kaffir lime leaves to their recipes… it makes such a difference! Is it hard to get in the US? Fast (although not as fast as the creator can make it!) and delicious. I will make it again, despite having a few other delicious curried cauliflower recipes, as it has it’s own uniqueness. Thank you. Wow, this dish is absolutely delicious and even better the next day when the flavors have had time to marinate together. I only added half of the serrano chili and thought the spice level was perfect. In fact when I tasted the curry I thought it would be too spicy but it later mellowed out after serving it with the quinoa and avocado. The avocado really adds a rich, creaminess that will be included every time I make this…which I think will be often. The cilantro is also a great addition. Dana—I have made nearly three dozen recipes from your blog and I would give them all a 5-star rating. This is the only place I go to try new things and now my go-to recipes. I especially love making your recipes for guests….they are always impressed with the creativity, the health factor, and the simplicity…as am I. This dish is no exception. Yay! We are so glad you enjoyed this dish, along with many others, Michelle! Easy recipe with delicious results! I can’t stop eating it!! Yay! We are glad you enjoyed it, Nicola! I made this last night for myself and my family of three male meat eaters. THEY LOVED IT! There were no noses turned up at the vegan meal. These guys used to think they had to eat meat at every dinner or it wasn’t dinner. Thank you for helping me to change their minds…one meal at a time! I made enough for leftovers..we’ll be eating it again this week. SO good! This recipe is excellent. I am nudging my son toward a vegetarian diet, and this dish has made him a believer! The planets aligned and I had almost all of the ingredients you listed in my kitchen. I had full fat coconut milk only. That made the curry nice and creamy. Once the curry was finished, I put it over cous cous and it absorbed all of the coconut milk. It was wonderful. I was tempted at the end to drizzle a little tahini overall but my son replied the dish is great just the way it is! Thank you for sharing your wonderful cooking ideas! My taste buds exploded with happiness when I made this. The recipe was super easy to follow and I love that you provide alternative ingredients. I made this tonight. SO good and just what I was craving!! I didn’t have shallot but did have red onion on hand and it worked. thanks for all you do! Yay! Thanks for sharing, Amber. I made this last night for my fiancé and I and it will be a staple in our house from now on! 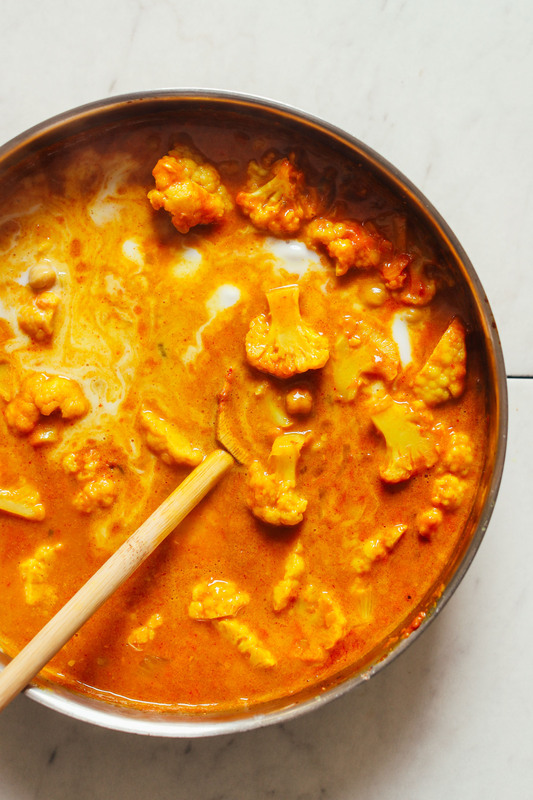 We try a lot of curry recipes and this was easily on of our favorites. Great balance of flavors, spice and saltiness, plus it was super easy to make. Can’t say enough good things about this recipe! Hi! I want to make this curry. However, I was wondering if I could substitute broccoli for the cauliflower. Should I simmer for less time? More time? Thank you! Hmm we haven’t tried broccoli in place of cauliflower and can’t say for sure. I would think it might change the recipe quite a bit, but would be a great addition to cauliflower! Let us know if you give it a try, Erica! Delicious! I increased the red curry paste to 7 tablespoons because I love the flavor, although it was pretty spicy. Will make again! Hi! I wasn’t able to get the curry paste, but planing to make this tomorrow. Thoughts on using curry powder and garum masala instead? Curry powder and garam masala will add more of a traditional Indian flavor to this dish, while the original inspiration for my recipe is Thai. 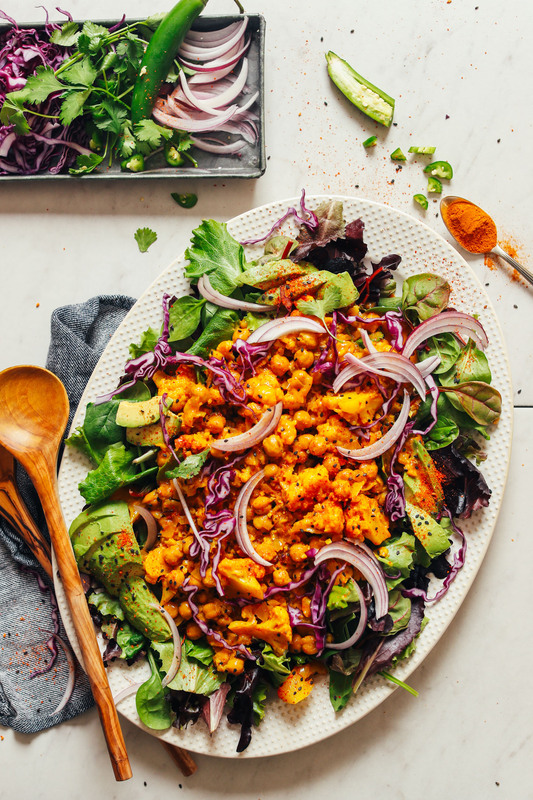 I absolutely LOVE how you served this curry on a salad! Curry is so perfect for salads because the curry sauce serves as the dressing, you have a bunch of roasted vegetables, and protein on top of plain bitter greens! I never would have thought of using maple syrup in a curry, either. Is it absolutely necessary? It is optional and can be left out! I made this and love it! So delicious. Great balance of flavors and spice. This tastes exactly like my favorite curry at my favorite thai restaurant! I added a red bell pepper in addition to the cauliflower. In the future, I will integrate even more veggies into this dish. 20/10 stars, can’t wait to make again! Lovely! So glad you enjoyed it, Chelsea. xo! Woot woot! We are glad to hear you and your family enjoyed it, Wren! I made this dish and really enjoyed it. In fact, I am planning on making it again this week. Yes, it is spicy but not the kind of spicy that burns your mouth like hot salsa. I made it as written. I am thinking that next time I may add a handful of golden raisins. I’ve made a similar dish in the past that included that ingredient and I liked the little burst of sweetness every now and then. Thank you for the recipe. When I am looking for something new to make, somehow I always wind up with one of your recipes ! Yum! I omitted the pepper and subbed soy sauce and brown sugar. 3 tbsp of curry paste was perfect. It was delicious with brown rice. Even though it’s 90 degrees outside, I really enjoyed making (and eating!) this. Next time I’ll add even more veggies! Woot woot! Thanks for sharing your changes, Claire! This is recipe is so yummy! I put in 2 tbsp of the red curry paste and just pinch of the sarano pepper. My husband and I would have loved it to be spicier, but we have a 7 year-old that would have not loved it. The amount of spice was just right for him – he devoured it and specifically asked me to comment that he thought it was “amazing”. We put it over greens (romaine and kale) and basmati rice, topped it with red onions and cilantro and squeezed some lime juice on top. So. Much. Yum. Thank you! This was amazing!! Reminded me of the yellow curry you’d order in a Thai restaurant…in fact I think this is better. It came out so rich and creamy, it’s beyond easy to make, and just super delicious!! I made it for 6 servings, which called for 4.5-6 tablespoons of curry paste — I substituted with 3 tablespoons of curry powder instead and it was full of flavor, the spice factor was perfect. I didn’t have any peppers on hand so just left that out…still fantastic without it. And I did half regular/half lite coconut milk. Just so so good, this is a keeper, thank you so much! This is the best curry I’ve ever made! I used full fat coconut milk and added some kale to it. I was so excited to eat this that I burnt my tongue. Oh well. Will definitely make it again! I just finished making your curry recipe! Yum!! I wanted to have enough for leftovers, so I doubled the recipe. 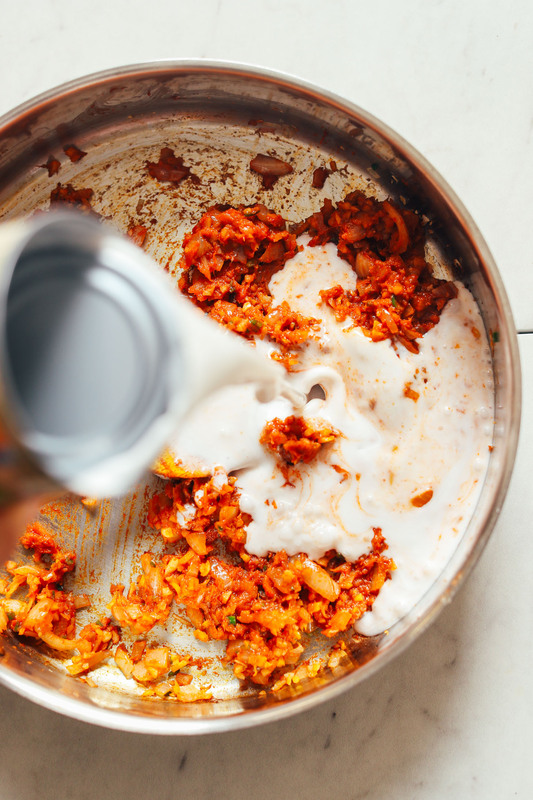 Since I used one can of light and one can of full- fat coconut milk, it was more liquidy than if it was all full-fat, but it did not matter in the least. That is what the rice is for- to soak up all that goodness. My husband told me twice while eating it how much he liked it. He just asked for me to put potatoes in it next time. It was not too spicy, just very flavorful. Thanks. Not too hard to make. And the most delicious thing I have eaten in months. We modified the recipe because we did not have serrano peppers on hand and substituted a canned chile in adobo sauce. Also mixed in (making the leftover situation easier) kale, and a bunch of basil that is happily growing on my deck as a just before serving addition. We got two generous servings, and there is another in fridge. Five stars out of five, maybe even five stars of of 4 it is so good. JUST LIKE A FANTASTIC THAI RESTAURANT. I live in Seattle and we have great Thai food and this recipe rivals those delicious places. I subbed 1 cup riced cauliflower and a jalapeño, because that’s what I had on hand. My friend made it exactly as written and it was also delicious. This was fantastic! I ended up not adding the serrano pepper, and only using 1-1.5 teaspoon of the red Thai Kitchen curry paste. To me it’s a cozy curry dish without the crazy spice. In fact, I wouldn’t say it was spicy at all.. Scale 1-10 my version was a 2 on spicy. I also used So Delicious lite coconut milk (11 oz) and then added 1/2 of a can of Thai Kitchen whole fat coconut milk. I did not use but maybe 1/4 tsp of coconut oil. My toppings were cilantro and red onion.. I can’t wait to go get some lime for this. Wish I grabbed some while at the store, but bought the ingredients off the top of my head. I also served over sprouted quinoa! Thanks for the recipe! This one is for the books. I made this on Monday for myself and today, Wednesday, I am making it again for the two of us. It was delicious on Monday. It had mellowed a bit on Tuesday as leftovers. I preferred it on Monday and did not find it to be overly spicy. I subbed almond milk for coconut milk – probably a little less creamy than it would have been with coconut milk, but turned out great! I made this recipe and we loved it! I added a little red curry powder because I didn’t have the Serrano pepper. It was delicious. Definitely will make again. Thank you for sharing! This is fabulous! I doubled it and used 7 tablespoons of red curry paste (Thai Kitchen brand) and we found it flavorful but not overly spicy. I did use serrano peppers, and added potatoes per my son’s request. Everyone declared it a “do-over”. Really delicious!! Loved the balance of spice, sweet and earthiness. My friends thought it was missing a little salt, but so easy to add to each plate individually. Thank you for another quick and delicious recipe! Hi, I’d like to make this but am wondering how to make it less spicy…? Should I put less curry powder, a different type of curry powder or omit the peppers? Let me know. Thanks! Hi Rachel! Omit the serrano pepper for less spice! I made this minus the serrano pepper with 3 tbs. of red curry paste and did not find it too spicy. It was so delicious- should have doubled the recipe. Love Dana’s recipes as they are easy to follow and include items I typically have in my kitchen. Thanks for another keeper! Yay! Thanks for sharing, Bridget! It was really delicious, used red curry paste from delhaize, the whole 250g jar and it was the right kind of spicy. I also cooked the cauliflower and the chickpeas a little more than suggested. Very good with cous cous as well. I was so excited to try this & love Thai curries but I used Thai Kitchen Light Coconut milk and I think that’s where I went wrong. It wasn’t creamy at all and kind of watery. I’m going to try this next time with whole foods Coconut milk or maybe Goya. it was my first time using Thai Kitchen Coconut milk and I probably won’t buy it again. My ratio of Shallot, Ginger, and Garlic was a little off too and Ginger came on too strong. I’ll have to try it again, but for now, I’m going to pour off the watery sauce mixture, use it to make rice (in place of water), and chop up the cauliflower and chick peas, add some more chick peas for a mash and make it into thai ish chickpea burgers…?‍♀️ which I guess will be a nice time to bust out the avocado oil mayo I haven’t tried yet. now i’m craving an Indian curry…. Thank you for all the good recipes, the comments in the Hummus post are fascinating!! Correction it was m Taste of Thai Lite Coconut milk and its terrible. Definitely trying this again with a better quality COconut milk! This was delicious. Easy and inexpensive. Will certainly make again! I didn’t have Thai curry pasta or maple syrup so omitted the syrup and used Gram Massala groud spice instead and it was fantastic! Soo good! Our family of four finished the pot in one night. Next time I’ll double it so we can have leftovers. I didn’t use the Serrano pepper but did use 4 tablespoons of Thai kitchen curry paste, and found it perfect. My 2 year old and 5 year old don’t have any spice tolerance and both asked for seconds. Any recommendations for coconut sugar substitutions? Perhaps just brown sugar? My grocery store does not sell it, unfortunately! Brown sugar or maple syrup! Dana, please keep those oil-free recipes coming! Not many people realize the ill-effects of oil consumption, even so called healthy oils. This is the best vegan blog on the planet, especially for those of us determined to stick to an 801010 or HCLF diet plan. So many options to choose from! Your attention to detail is inspiring. Glad you enjoyed it, Sandy! Good recipe–had no Serrano peppers but otherwise everything else. It was very tasty and not spicy at all. Will be making it again in the future! A KEEPER!! This is super easy to make and so delicious that all three of my delightful yet painful children ate it. I added some tofu for extra protein for my body conscious 14 year old, a packet of fresh spinach and one cup of brown cooked rice. It’s made it to my fortnightly menu plan. I need to try this recipe next week ! It looks so easy and delicious ! Thank you for sharing ! The avocado ? slices in the serving platter look so enticing. Perhaps you could add avocado to the list of optional ingredients? Another recipe to put on the menu for this week. Thanks, Dana! Loved it! I used 3T of curry paste and subbed a jalapeño since I had it on hand…. tasted amazing! Spice was perfect for me. Served over a thick rice noodle, super yummy! Thanks so much for all your amazing recipes! Love your creative, yummy mind! Whoop! Thanks for your review! Do you think frozen cauliflower would work here? Thx! Thanks for the tip, Ida! This was really great! My 4 and 6 year old girls loved it as well. I did not have the pepper so I omitted it but kept everything else the same. That should say “over brown basmati rice”. Thanks! It was delicious! I used only 2 Tbsp of red curry paste for double the recipe as I’ve found it way too hot in the past. I even made your coconut milk recipe for it as it’s so quick to make. I served the curry of brown basmati rice. The taste was just perfect! Yum!! Lovely, thanks for sharing, Ali! 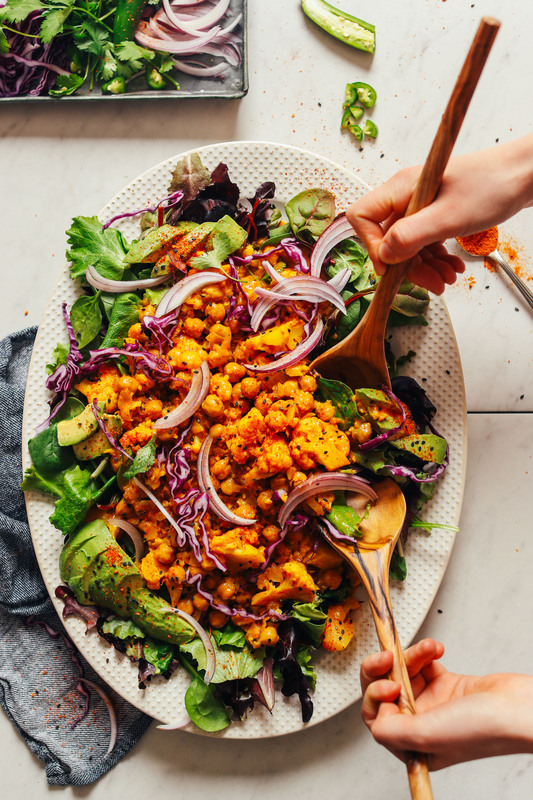 I am a huge fan of both cauliflower and chickpeas, so I had to try this recipe right away – it did not disappoint! The only substitution I made was 1/4 of a scotch bonnet pepper for the serrano (since it was what I had on hand and couldn’t wait! ), as it is a spicier pepper. The curry was flavourful, creamy, just the right level of spice. So delicious! Will definitely make again! Thanks for creating and sharing such tasty and enjoyable plant-based recipes with the world! Can stevia replace the sugar? Hey Brandon! I’ve just made this and forgot to add sugar altogether, it was still delicious. I think if I had added sugar it would have been unbearably sweet… Try without sugar then taste at the end and, if you really need to, add a little stevia. I’m making this recipe right now and can’t find any mention of when to add the tamari sauce, so am adding it with the coconut milk, turmeric and maple syrup. Hope that’s right….. Fixed! It goes in when you add the turmeric and maple syrup. Sorry about that! I came here to ask the same question ? Hi, hoping you can help. I am allergic to coconut. Do you think it would work with almond or cashew milk instead. Big thanks. Hmm, coconut milk is a key ingredient but if I were to suggest an alternative I’d probably say cashew or almond, or maybe even rice. Let us know how it goes! I didn’t have coconut milk in the house and used part whipping cream and part 2% milk and thickened it with a cornstarch slurry and it wasn’t as authentic but still delicious and the whole family loved it. Hmm, that’s definitely possible. But I find that amount necessary for the proper amount of flavor. We like spicy food as well, but didn’t find this amount too spicy. Next time definitely scale back and I’ll add a note there as well! I made it with 4 tbsp and it was perfect. I did omit the Serrano pepper and instead added a red bell pepper, so that probably helped out. Either way, the dish is amazing and I plan to make it again very soon. Thank you for all your amazing recipes. I only have green curry paste in my pantry. Would you recommend changing any other ingredients if I substitute green for the red paste? Hmm, I don’t think so. Green curry paste just has a different flavor and color but overall the recipe should remain the same. Let us know how it goes! I tried it with green curry paste and it was delicious! Didn’t need to modify any of the other ingredients. I just made the recipe I used red curry paste and and added a little more ginger. I’ll be serving it with quinoa.Thank you for the great recipe. YES, curry is one of my absolute favorites! Can’t wait to try this one out.